Artist Rocky Schenck recreates dreams with friends and strangers for his photographs, which feature the hypnotic figures set amongst haunting landscapes that conjure fantasy narratives and the dark recesses of the imagination. 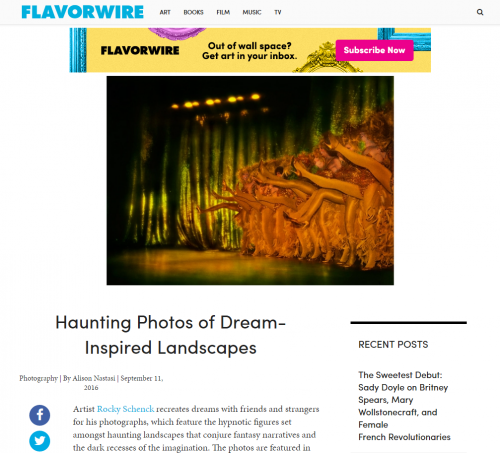 The photos are featured in Schenck’s newly published second book The Recurring Dream. “Where do these images come from? They’re shrouded in secrecy, soft-focused yet vivid, suggestive like waking dreams,” writes The Exorcist director William Friedkin in the book’s foreword. Look for Frances Bean Cobain on the cover of Schenck’s monograph as an Ophelia-esque nymph in the water on the edge of a gnarled forest. See a preview of The Recurring Dream from University of Texas Press in our gallery.